Donna Marcano-Javier says she loves watching the “Family Feud” game show on TV. When she saw that the Maryland Lottery had its own version of the popular game show in the form of a scratch-off ticket, she decided to buy one. The 57-year-old grandmother from Middle River had no idea that once she scratched her “Family Feud” instant ticket that the survey would say she needed to head straight to Lottery headquarters to claim her $50,000 top prize. When Donna finally checked to see the prize amount, she received the surprise of a lifetime. Donna, who is retired, said her husband will also be retiring soon, and they hope to start some home renovations. “I would love to get central air in my home and then maybe use another potion towards our annual vacation,” she said. The retailer is a winner as well. 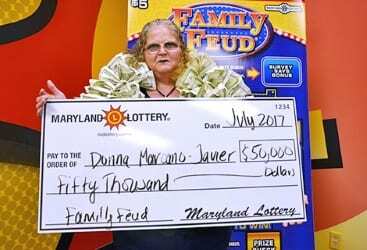 For selling Donna’s top-prize-winning ticket, the Shoppers Food & Pharmacy store at 1200 Eastern Avenue in Baltimore will receive a $500 bonus from the Maryland Lottery. The $5 Family Feud ticket launched in April, and five of its $50,000 top prizes remain unclaimed along with eight $5,000 prizes and thousands of additional prizes ranging from $5 to $1,000.